Town Hall Meeting – You’re Invited! 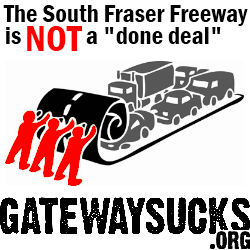 Join the South Fraser Action Network for a townhall meeting focusing on the effects of the South Fraser Perimeter Road. There will be a group of speakers followed by a chance to ask questions and voice your concerns. Harold Steves, co-founder of the Agricultural Land Reserve and the Farmland Defence League. Stephen Rees, transportation economist and planner (ret. ), blogger. Alexandria Mitchell, high school student and Copenhagen Climate Change Conference delegate. Graeme Drew will be moderating. Topics will include the social, environmental and economic impacts of the road, as well as actions you can take to help save Delta from the SFPR. Have Concerns? Come Have Your Say! All of Delta’s elected officials have been invited, come let them hear your opinion. It is not a done deal. This road can be stopped. Even if you live outside Delta or Surrey this $1.1 billion road impacts you – your air quality, your environment, your climate and your tax dollars. Let’s work together for better solutions for our region! For more information call Anita den Dikken at 604 948 0139. Download the poster and help spread it around!